Andres appears to have it all. He owns a successful printing company, lives in a beautiful house in a wealthy neighborhood, and is married to Marabela, a beautiful and strong-willed woman who works as a freelance photojournalist and is a devoted mother to their two children. But appearances can deceive. All is not well in the Lima, Peru home of the Jimenez family. Marabela recently left Andres, only to return after four days for the sake of their children, Ignacio and Cynthia. Andres still loves Marabela and tries to save their marriage, but she is uncooperative. She has grown tired of Andres’s workaholic lifestyle and resents having to give up most of her photojournalism work. They talk past each other; Andres is too eager to please, which Marabela interprets as weakness. She is often callous and self-absorbed. The tension is palpable. This already difficult situation falls away instantly when Marabela is kidnapped and held for ransom by men who may be associated with Shining Path, a communist insurgent group that terrorized Peru in the 1980s and early 1990s. Andres is distraught but, with the help of Guillermo, a retired police officer-turned-negotiator, he begins to work toward Marabela’s release. Andres and Guillermo work from Marabela’s darkroom, which they have converted into a custom-designed office wired to record calls and maintain records of all communications and activities regarding the kidnapping. With the hours of waiting stretching out before him, Andres has time to explore their failed marriage and home life. Through a series of flashbacks we learn how he and Marabela met and how his decision to marry her affected Andres’s lifelong friendship with Elena, the daughter of his father’s business partner. Their romantic history is full of complexities that have reverberated down through the years. How far will Andres go to obtain the return of a woman he loves but believes may well leave him again? What does he owe her? What will be enough to free her and also convince her to stay and rebuild their marriage? Can he obtain her release without giving up everything they’ve achieved? Does he possess enough to satisfy these hardened and very professional kidnappers? Andres also has his hands full caring for the children, whom he is trying to protect from the truth about Marabela’s sudden absence. Ignacio, who is in high school, suspects all is not as it seems and wants to know the truth — and to help his father. Andres is also trying to keep the kidnapping from colleagues, friends, and family, including his very shrewd mother, Lorena, from whom he has been estranged since he married Marabela. After many years apart, Andres reestablishes contact with Elena. He has learned that she may have special knowledge and insight that could help him through his difficult situation. Can she help save Marabela and thus Andres? Sylvester turns what could have been a soap opera into a suspenseful and literary novel through a tightly controlled narrative that provides a detailed view into the main characters’ hearts and minds. She has tamped down the melodrama in favor of a more subtle emotional intensity that builds as the story progresses. The nature of the plot alone provides plenty of conflict and page-turning suspense; Sylvester had the good sense and discipline to opt for a thoughtful, probing approach that will remind some readers of Ann Patchett and Graham Greene, with the elegant prose to match. 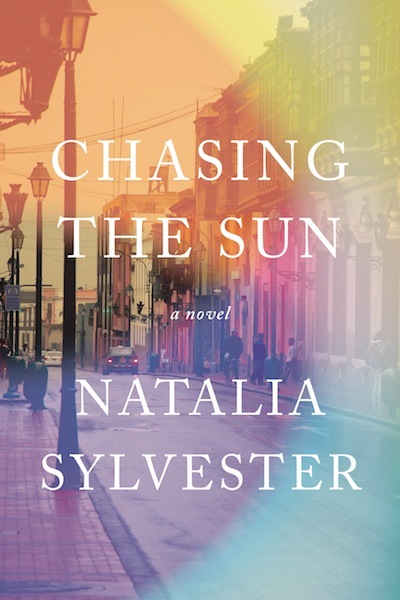 Chasing the Sun is a summer novel for readers who want something to think deeply about as their hearts pound and they turn the pages, hoping for the best but fearing the worst.